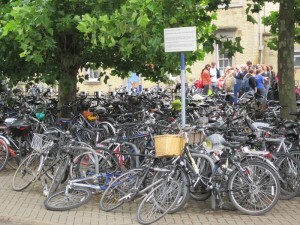 Around 2,000 bikes outside everyday. You have to remember exactly where you left yours. One day I got off the train and finally found my bike. It was locked, of course, but the person whose bike was sharing my rack had managed to chain mine to his (hers). I went to the cop who has a little cabin in the car park – saw that he had a bolt cutter – and asked him to do the business. He told me that he couldn’t because it was illegal. I asked him to lend me the bolt cutters. He told me that if I tried to cut someone else’s chain he would have to arrest me. It seems that if anyone chains up your bike there is nothing you can do about it. I walked home.